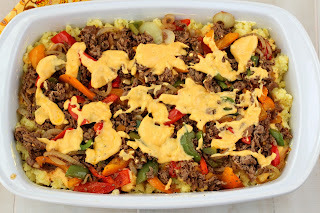 Philly Cheese Steak and Potato Casserole is layered casserole recipe that has a base of smashed potatoes that is topped with a cheese sauce and finished off with a layer of steak and peppers and some more cheese sauce for good measure. 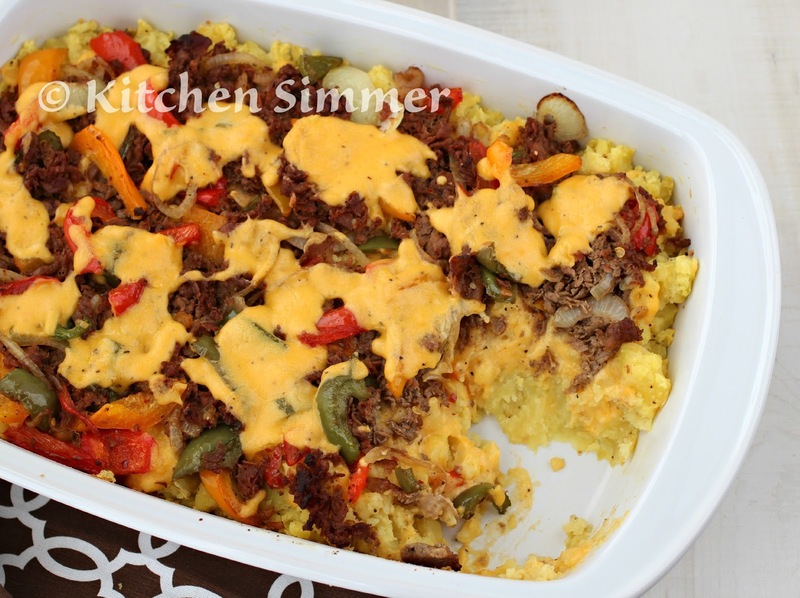 It's a steak and potato casserole that will satisfy even the most hearty appetite. 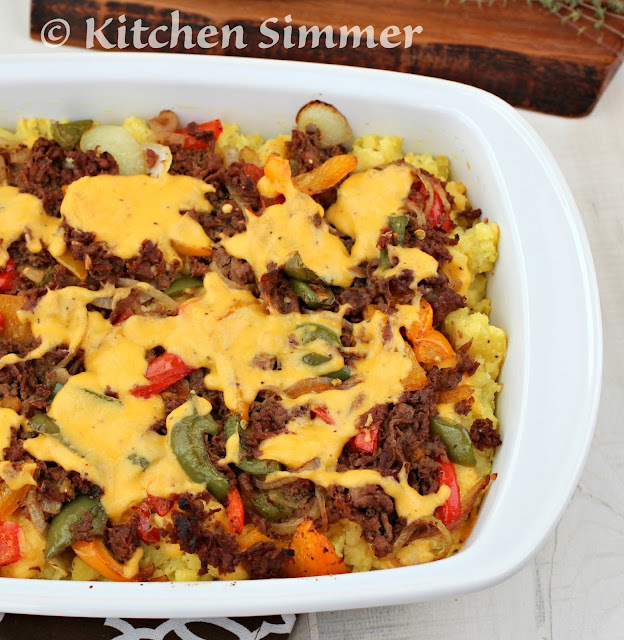 Steak, Potatoes and Cheese... now those are definitely some ingredients that my husband and son adore. 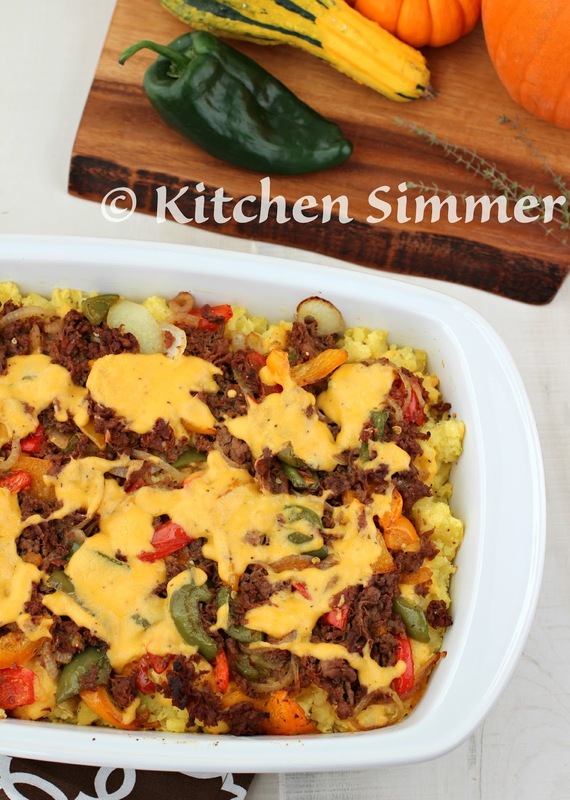 I love that this casserole because it comes together really easily and is served out of one baking dish. This Philly Cheese Steak and Potato Casserole is so hearty that your hungry guys and gals will fill up with a smile. I had my two men running to the table before I could even say dinner was ready. They could smell the sauteing beef, peppers and onions and started asking me when dinner was ready from that moment until the food was on the table. I knew I was onto something good from all that enthusiasm. So, how did I think up this casserole? It's easy... 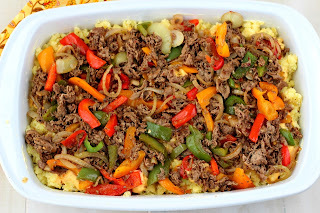 I forgot I already made my steak and cheese subs for the blog when I bought shaved beef and peppers to make some steak and cheese subs for the blog. You have to pardon my lapse in memory, I have almost 1500 recipes here and I truly forget some of the dishes I have made before. So a thought about it for a while (I usually day dream about recipes while I am doing dishes or laundry) and I decided beef and potatoes always go well together so I would incorporate some potatoes to the dish instead sub rolls. I had no idea how it would turn out, but I am so glad I took the chance and gave it a try. I am not much of a meat and potatoes girl.. I'm more a rice and curry girl, but my daughter and I loved this dish as much as the two boys in our house. My son actually said it's the best dish ever. I guess this mom deserves a big pat on the back. Maybe, it's good that I sometimes forget what I cook for the blog and have to make a new game plan. Challenging myself in the kitchen keeps my cooking chops sharp. Step 1: Peel, cut and boil potatoes until they are tender enough to smash. Drain and place back into pot. 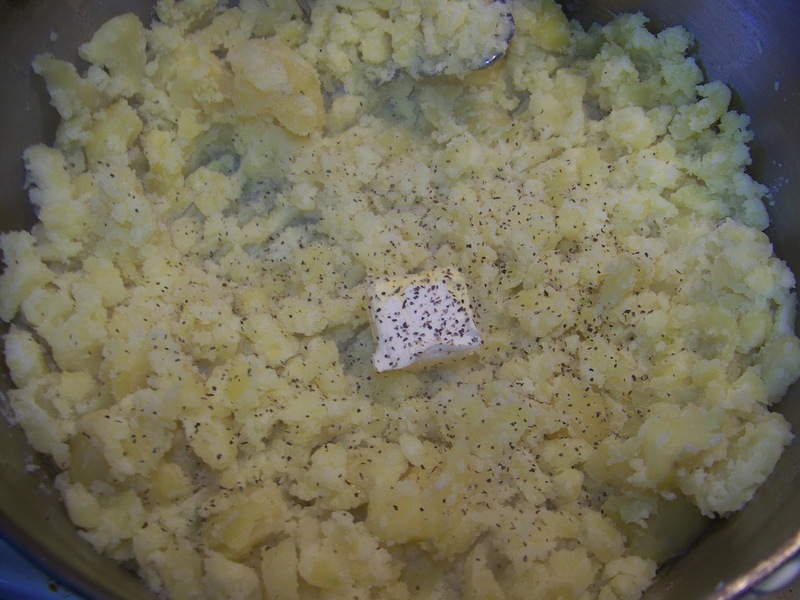 Smash with potato masher and season with butter, salt (lightly) and black pepper. * Note: Season potatoes lightly with salt because cheese sauce will also season them with salt. Step 2: Heat a large skillet with 2 Tbs canola oil. When oil is very hot add the beef. Saute with salt, black pepper, red chili flakes and garlic powder. When the beef is half way cooked, add the sliced peppers and onions. Then add the Worcestershire sauce. Taste and set aside until later. Step 3: In a pan, stir together butter and flour over medium heat. When flour cooks for a minute, slowly add the milk and whisk or stir until a thick milk mixture forms with no lumps. 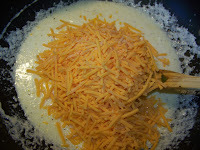 Then add sour cream and grated cheese and stir for several minutes until cheese sauce forms. Season with black pepper, salt and a little garlic powder. First butter casserole dish. Then fill the base with a layer of seasoned smashed potatoes. Take a fork and make and "rake" or make crevices for the cheese to drizzle into the potato. Then pour the 3/4 of the cheese sauce over the potatoes. Next layer with the steak, onion and peppers. 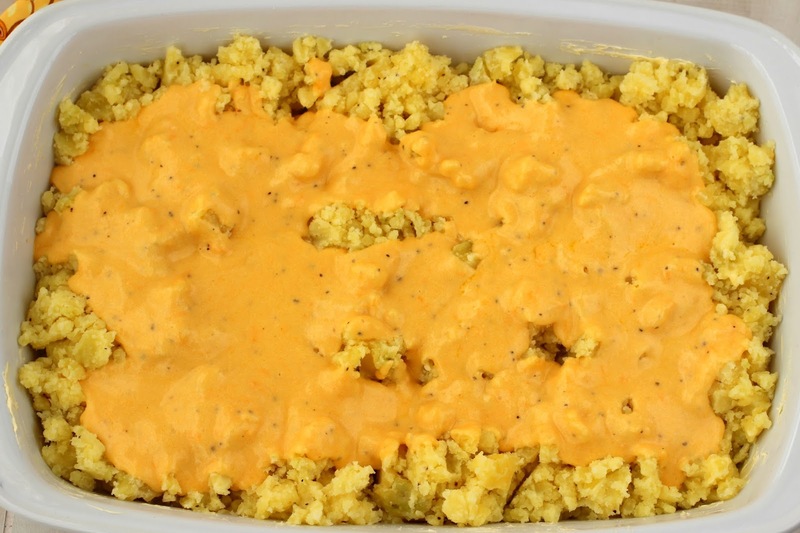 Make sure to cover the entire casserole from end to end. My father in law loves philly cheesesteak. 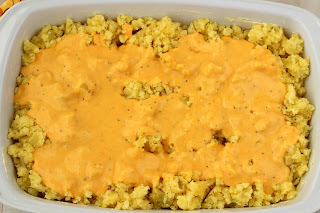 This would be a fun casserole for him to make and enjoy! Thanks for the great recipe! Oooh I LOVE philly cheesesteaks but I've never thought of putting it into a casserole! Yum! I ate my first Philly Cheesesteak Sandwich not too long ago... but it didn't take me long to LOVE LOVE LOVE it. This is brilliant Ramona! I'm jealous of people who can eat that many calories! I think I'd like the dish better with mashed potatoes than on a sub bun. 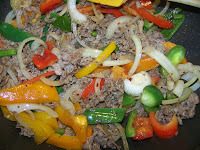 Extra delicious recipe Ramona, one that all my four boys and my husband will particularly enjoy. They are all Philly cheese steak fans! Have a beautiful weekend! It looks super comforting and packed full of flavour! Woooo, now this is a brilliant casserole!! 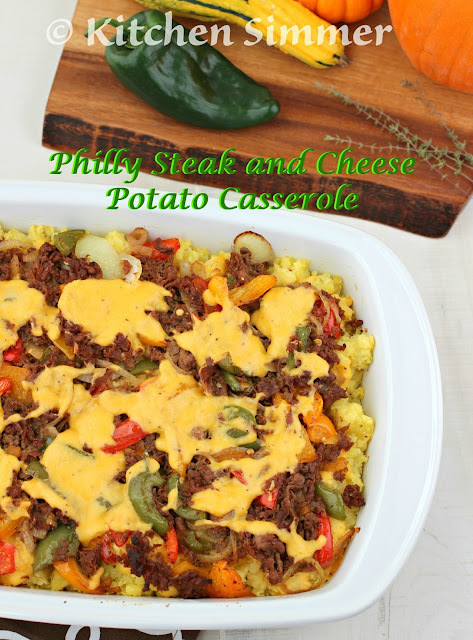 Philly Cheese steak and potatoes?! My idea of heaven! I'm glad I'm not the only one who forgets what they've already posted. And now I'm even forgetting some that I've updated with new photos!! But I'm glad the lapse in memory brought about this wonderful casserole! Thanks Liz! LOL! Yes... I totally forget sometimes and so does my family. They always say when did you make that? Gold star for you Ramona this is a winner! My sons and husband would love this. I love the sound of this, I've only had Philly Cheese Steak once and loved it! Thanks Brian! Yes, Philly Cheese Steak is pretty awesome! I could dig right into that - it looks awesome!